Dark Energy Survey scientists have developed a new algorithm to match Type Ia supernovae (SNe Ia) to their host galaxies. These supernovae are critical tools for understanding the history of our Universe. In 1998, these incredibly bright stellar explosions were used to determine that our Universe is not only expanding, but that this expansion is accelerating! We can use the brightness of a SN Ia explosion to estimate distances in space: the brighter an explosion is, the closer it is to us. By studying the relationship between the distance to the event and how long ago it occurred, signified by its redshift, we can figure out at what rate the Universe has been expanding at different times. This is crucial information in figuring out the overall makeup of our Universe, such as how much of our Universe is made of dark energy and what properties dark energy may have. Knowing the redshift precisely is incredibly important – using the wrong redshift can dramatically change your predictions! While the most reliable way to confirm a redshift is by looking at the spectrum (the amount of light at each visible wavelength) of the SN Ia itself, obtaining real-time spectra for the thousands of SNe detected by DES is not an easy, or realistic, task. However, getting redshifts of the host galaxies (i.e., the galaxies in which the SNe explode) long after the SNe have faded away is easier to do. While the DES telescope in Chile does not take spectra itself as part of the survey, DES has partnered with programs such as OzDES (an Australian-led team) that measures spectra, often following up DES discovered objects. Using these host galaxy redshifts in lieu of SN redshifts is common practice when you have such a large set of SNe Ia. But this relies on the fact that you’re correctly matching the explosion to its host! In theory, this should be pretty straightforward – just pick the galaxy closest to the SN Ia. However, determining what is “closest” becomes tricky when your data consists of two-dimensional images that are actually projections of a three-dimensional space. As shown in Figure 1, it can be unclear which galaxy is the correct host for a given SN Ia. In the figure, the center of the smaller galaxy to the right is “closer” to the explosion than the larger galaxy on the left; yet, it’s possible that the smaller galaxy is actually a distant background galaxy, unassociated with the SN. 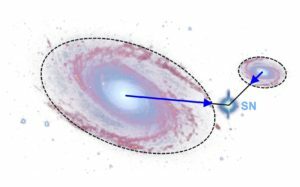 Dr. Ravi Gupta and his colleagues in the DES supernova working group have created a new, automated algorithm to match SNe Ia to their hosts. 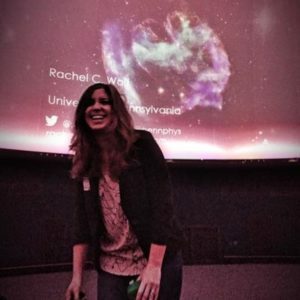 This technique uses information about galaxies near the SN Ia, such as their shapes, sizes, and orientations. Another piece of information used is something called the host confusion parameter. 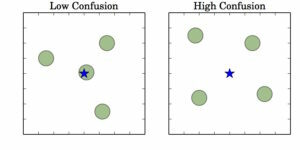 The host confusion parameter describes, in a numerical way, the degree to which a SN Ia might get mismatched to the wrong host. Quantifying host confusion turned out to be useful, but this parameter by itself was not as powerful of a tool as the authors had hoped. This led them to consider using machine learning, which harnesses the power of computers to solve problems with greater flexibility by recognizing patterns in large amounts of data. “The idea of using machine learning came to me when I was trying to write down some optimal function for quantifying the level of host confusion [the host confusion parameter], and I thought: ‘A computer could probably figure this out better than I could,’ ” says Dr. Gupta. So they proceeded to develop a machine learning classifier that uses information about the galaxies near each SN (including the host confusion parameter) to determine the probability that the SN Ia is correctly matched to its host galaxy. This new algorithm was tested with catalogs of galaxies and simulated SNe Ia positions, and results in a matching accuracy of 97%. 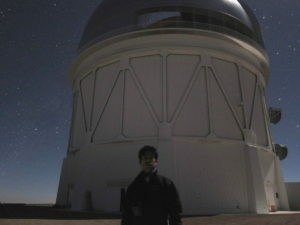 The method Dr. Gupta and his colleagues created can be used for other supernova programs besides DES, but in their work they caution that exact results are dependent on the details of the survey. In the future, they hope to study how the cases where the SN Ia is mismatched will affect other science results using SNe Ia. You can read more about this analysis, Host Galaxy Identification for Supernova Surveys, online on the arxiv. Ravi Gupta is a post-doc at Argonne National Laboratory. 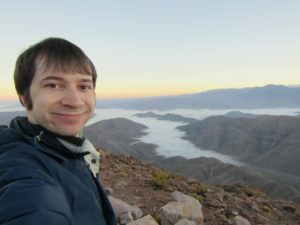 He did his graduate work on SN Ia host galaxies at the University of Pennsylvania and has been working with the DES supernova group for the past 5 years. His hobbies include music, movies, photography, and drawing. You can find some of his drawings in The Dark Bites.